More than 550 professionals from a total of 775 of KPMG Abogados make up the workforce of the firm's fiscal area. This large body of professionals means that we have specialists in all of the taxes affecting companies and individuals. This, together with our specialisation in sectors and global network of firms in 154 countries (more than 35, 000 professional in Tax), sets us apart and allows us to render services of extremely high quality, offering substantial added value. We cover the full spectrum of tax issues, including tax litigation and inspections, assistance in tax rulings to be filed with the Spanish General Directorate of Taxes, tax optimisation services, CIT consolidated tax regime and VAT grouping. We provide services to more than 3,100 clients, and, regularly, provide advisory services to the main IBEX-35 companies and high-profile multinational groups. We are leading experts in direct and indirect tax planning in any transactions and matters, including mergers and company reorganizations. We are also very strong in European tax matters, and have advised or co-advised large IBEX-35 clients in tax litigation procedures of maximum relevance, both in the European Union Court of Justice as well as general courts. 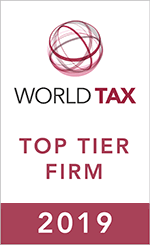 We are very well known in relation to Transfer Pricing issues, with one of the largest department in this area.